Sea, Sand & Sky: A Crabby Couple of Days! If you scroll down read my previous post ("Testing the Waters! 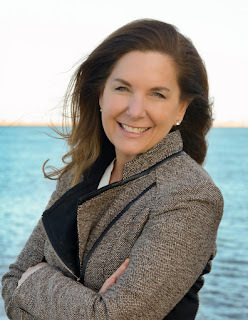 "), you'll see that the youth staff here at Save the Harbor / Save the Bay is proudly taking part in a large effort of citizen scientists across the Harbor to holistically understand the water, and the species that inhabit it, better. In addition to testing salinity and clarity, we're also counting crabs! At many of our sites, especially the ones with shores to explore, we are taking random samples of the beach and counting what we find within a predetermined dimension. We're recording quantity, gender, and size (we measure the width of the carapace of the crab-- the main part of its body, which doesn't include its legs). Wednesday, our crab counts officially began! I have to begin by telling you that South Boston is CRAWLING with green crabs and Asian Shore crabs. Put a trap down off the dock, and you'll have a green crab within a few minutes. Overturn any huge rock, down past the swimming beach, and you'll find several Asian Shore crabs frantically scuttling sideways for cover. 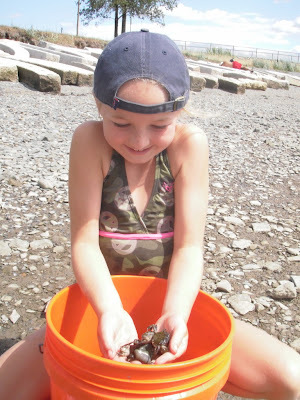 Look at our friend Emily, elbow deep in a bucket of Asian Shore crabs! They're everywhere! That being said, when we took our predetermined circle (a bike tire- how's that for citizen science?) and headed down to the intertidal zone in Pleasure Bay... can you guess how many crabs we found in our circle? When we did the experiment on Wednesday afternoon, at first glance, the answer was zero. NO crabs, in SOUTH BOSTON? It's crab city over there! When we turned over a few of the bigger rocks in our sample area, we finally counted 5 tiny green crabs scurrying about. Each had carapaces under 1 cm in width and were so sneaky that they evaded their capture, so their genders are all still unknown. But what South Boston lacked in crabs during this experiment, it certainly made up for in periwinkles. In just our little sample circle, we found 32! Today, Thursday, yielded similar results. The tide was slightly higher, which gave us even lower hopes for crabs along the shore-- it was much more likely we would find them in the lower intertidal zone, if we were going to find them at all. And, as expected, each time we threw down our circle, no crabs were found within. I am confident that low tide will expose many more crabs to our analytical fun, but the gray rocky shore at high tide seems less welcoming and far more exposed than what I would personally prefer if I were a crab. So I can't blame them for not coming out when we needed them, because that's science! And no experiment is a failure. Especially not when you're having fun. Excellent work - I bet that your "Low Tide" theory is right. Can't wait to find out.